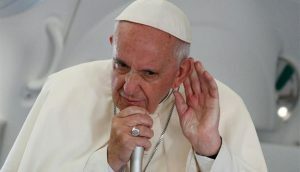 “…This is apparently how Pope Francis understands fundamentalism as well, based on remarks made on several occasions, most recently in his presser on the flight back to the Vatican from his time at World Youth Day in Krakow. As is often the case during such press events, his remarks were fragmentary and not entirely consistent. I don’t like to speak of Islamic violence, because every day, when I browse the newspapers, I see violence, here in Italy… this one who has murdered his girlfriend, another who has murdered the mother-in-law… and these are baptized Catholics! There are violent Catholics! If I speak of Islamic violence, I must speak of Catholic violence . . . and no, not all Muslims are violent, not all Catholics are violent. It is like a fruit salad; there’s everything. There are violent persons of this religion… this is true: I believe that in pretty much every religion there is always a small group of fundamentalists. Fundamentalists. We have them. When fundamentalism comes to kill, it can kill with the language — the Apostle James says this, not me — and even with a knife, no? I do not believe it is right to identify Islam with violence. This is not right or true. For the whole insightful article and the multitude of comments, click HERE.